Character meals are by far the most expensive meals you can eat in the park, and if you are planning on coming during Star Wars Weekends they are also among the most popular. Make your reservations RIGHT AWAY if at all possible. They may already be completely booked. Plain and simple you are not coming for the food. The Star Wars Galactic Breakfast is not buffet and is only adequate in taste (except for the pastries which are phenomenal – particularly the C3PO double chocolate muffins). You are coming for the experience. Whether you have kids or not, that is what you are paying for, but it’s quite the experience. 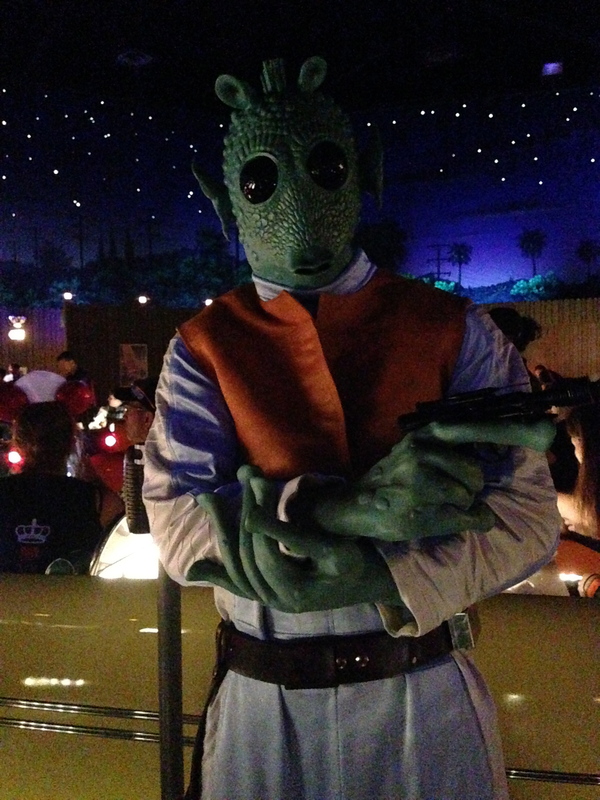 If you’ve been to the Sci-Fi Dine-In Theater normally, this is an even more different experience than that – in a fun, Star Wars way. You begin your morning meal by taking a picture with Darth Vader and Boba Fett in the entryway. Instead of coming by later and asking you if you’d like to buy the picture, the cost is included in your meal as a free download through PhotoPass. When you sit down they hand you a menu and bring you a more than ample plate of those delicious pastries. 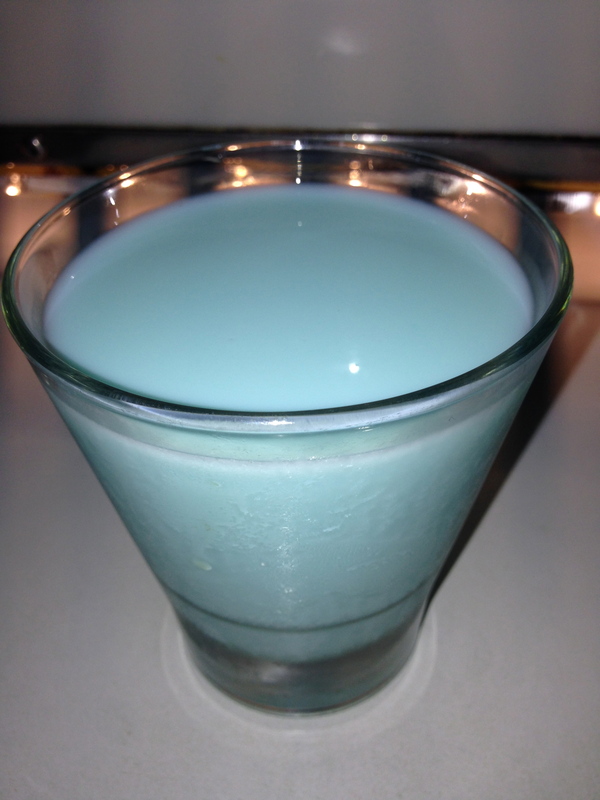 They ask you what you’d like to drink – alcoholic choices cost extra – and they have all the normal options in the park plus Blue Milk. It tastes like raspberry and is sweet. Definitely different if you’re daring. Plus if you don’t like it, they will gladly bring you something else. You then select an “Anchorhead Appetizer” – either a Greek yogurt parfait or seasonal fresh fruit – and one entree. Each entree is named after something in Star Wars. 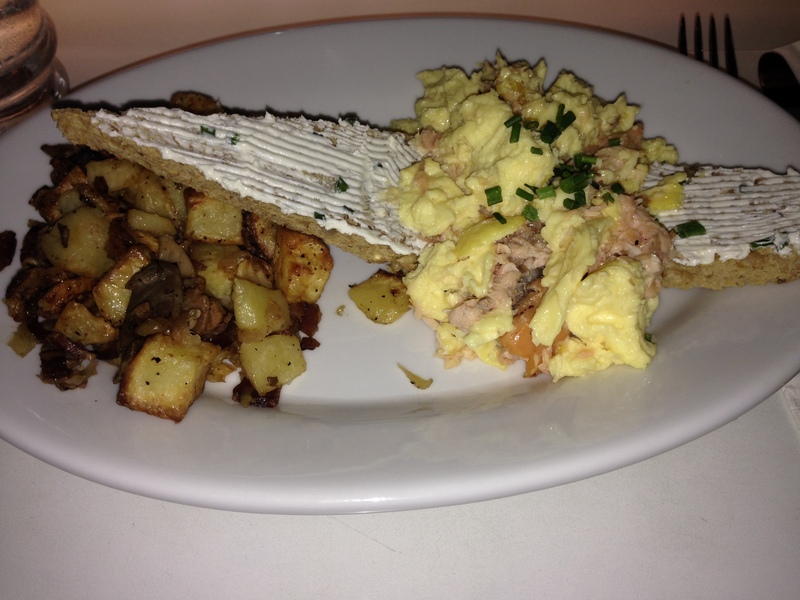 I ordered The Dune Sea which consisted of smoked salmon in scrambled eggs with a potato hash and toast. There is also grilled beef tenderlion, banana-stuffed French toast, shrimp and grits, and a veggie egg white omelet. If you want something more traditional they offer a basic scrambled eggs platter with bacon, sausage, and potatoes. Kids meals are relatively simple also. Star Wars theme song sing-a-long – too funny! While you are waiting for your food, on the giant screen in the restaurant they show clips of all the different Star Wars movies including the rarely scene first appearance of Boba Fett in the Star Wars Holiday Special. 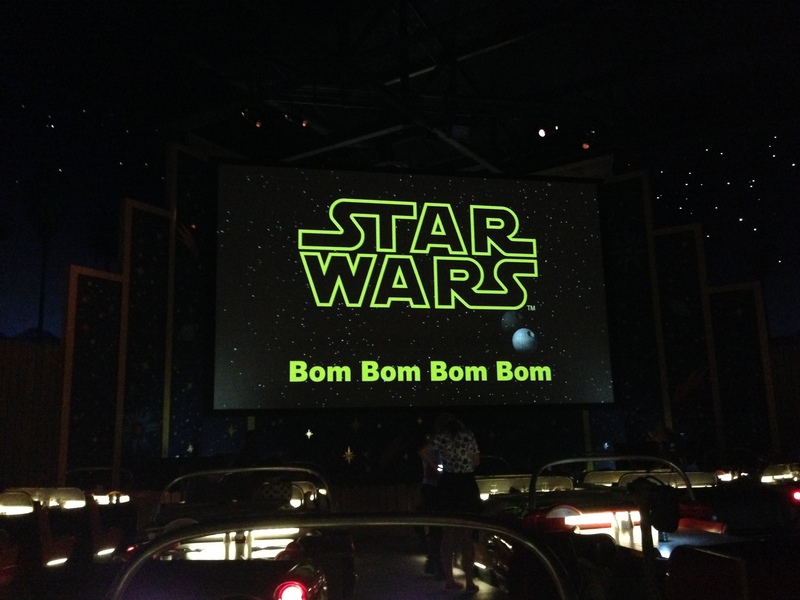 The best was the Star Wars Theme Song Sing-A-Long. You have to see it for yourself. Characters roam around the seating area and pose for pictures. You’ll find Greedo, Stormtroopers, and Jawas scattered about the room. They’ll pose for you or pose with you or both! The character interaction is great. Waiting for an opportunity to meet these characters in the park could take a long time, especially for Darth and Boba Fett. Darth alone probably saves you an hour in the park or more. The meal concludes with a strawberry boba dessert which I didn’t try since I’m not big on boba. 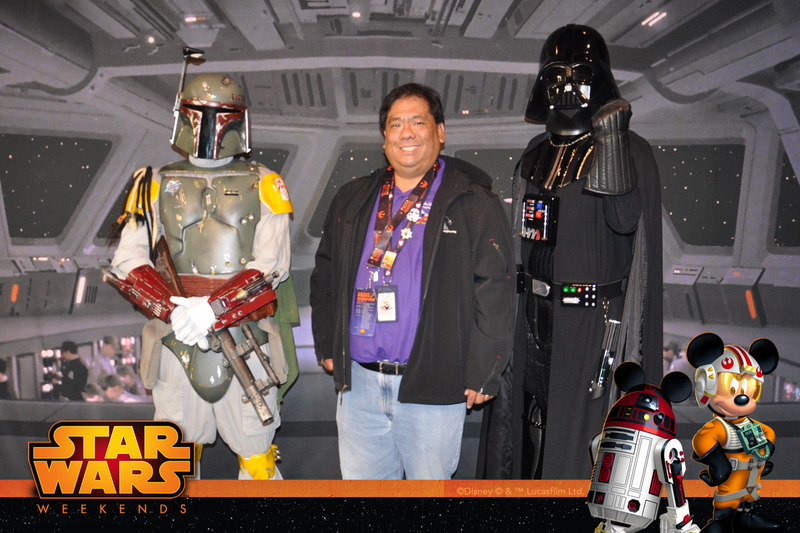 Overall, it is a lot of fun and if you want autographs and photo opportunities as well as a photo download with Darth and Boba Fett, then it’s worth the price. But if you’re going for the food, you’ll be disappointed. It’s not that the food isn’t good, it just isn’t $50 good. It isn’t buffet and you can’t customize your plate. But it sure is a lot of fun. Again, make sure you book early! 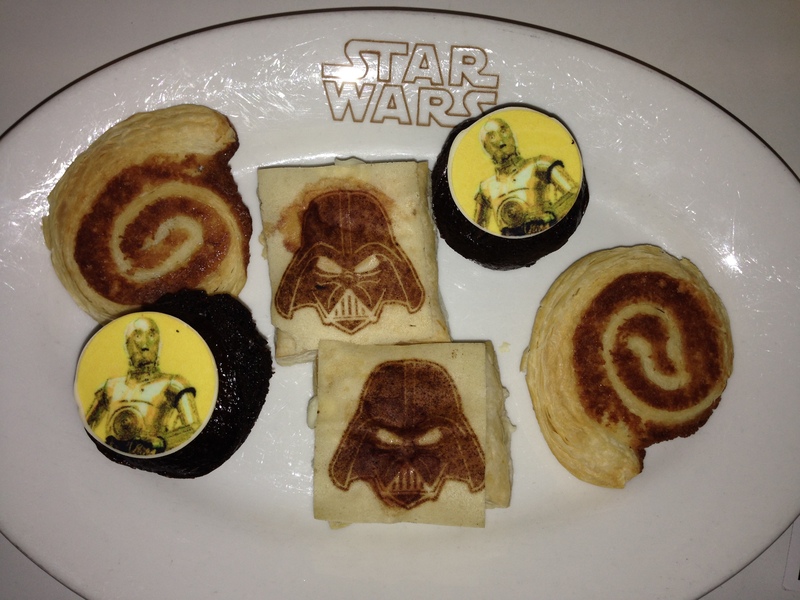 Pingback: Disney Foodie Spotlight: Jedi Mickey’s Star Wars Dine at Hollywood and Vine – #StarWarsWeekends | Disney Nerd!